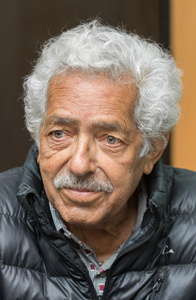 Born in Cairo in 1929, he is internationally renewed as one of the Arab world's leading sculptors. While his work displays strong references to Egypt's pharaonic past, his use of solid, simple forms and clean lines also reveals an astute talent as a distinctly modern artist. prominent themes in his work include prayer and enlightenment , motherhood , the Bird , ascension (as displayed in his obelisks) and crossing , which is one of the more prevalent themes in his work , and is expressed through his renderings of ships , boats and ferries . Henein works in a variety of media including bronze, wood, clay and granite.. He is also a painter. Henein has held numerous critically acclaimed exhibitions , including solo shows at horizon one hall , ministry of culture , Cairo 2008 ; Metropolitan Museum of art (with Farouk Hosni) , New York , 1999; ASB Gallery , Munich and London (1998); Egyptian Cultural Center , Paris (1987); Sultan Gallery , Kuwait(1983); and the Egyptian Academy, Rome(1980) . He has participated in group shows in Paris, Naples, Rome, Venice, Alexandria and Cairo.. His first realised he wanted to be a sculptor at the age of eight, during a class trip to the Egyptian Museum in Cairo.. Then he went on to study at the Academy of fine Arts in Cairo, receiving his diploma in 1953.. After graduating he travelled to Luxor & Aswan, where he immersed himself in the study of the cities' mineral landscapes. In 1971, Henein travelled to Paris to learn more about art and take part in an exhibition of contemporary Egyptian art at the galleria Museum.. un- expectedly , he ended up residing in the French capital for 25 years , from 1971 to 1996 , during this period , he also travelled to Italy particularly to Pietrasanta , where he befriended the caster Mariani . Despite his extended sojourn in Europe, Henein never creased to draw inspiration from his own heritage. When he returned to Egypt, Henein's reputation as an artist of international renown and prominence was already established. As a result, Farouk Hosni, Egyptian minister of culture, requested that Henein administer the restoration of the Great Sphinx at Giza. He also founded and is the curator of the Aswan International Sculpture Symposium (AISS) which offers sculptures from over the world on the Egyptian Granite. Although Henein's work evokes a strong attachment to the traditions of pharaonic Egypt and Arab culture, modernity is central to his artistic vision. Indeed, Henein's vision has been consistent throughout his life's work.. Ultimately, Henein is not representative of the modern arts of the Arab world but the international art world as a whole.